Choose your metal and chain length for a beautifully personalized name necklace. These necklaces will last to be passed down if taken care of properly, especially the precious metal ones. They are affixed to a chain in the same metal of your choice and in your preferred finished length and then they are ready to ship. Please tell me the name or word you wish in the note to seller field during the checkout process. I need to know the proper spelling of the name or word including capital lettering in it's proper place. Please understand that I generally do not make a name with all capital lettering. They don't generally work out as well that way. It "can" be done, but if you want this please send me a message prior to purchase to discuss it. If you show me the name in all caps, I will capitalize the first letter only and make it with the rest lowercase by default unless you message me. I can add a heart if you prefer to the end of this. If you want the heart, please let me know in the "note to seller" field during the checkout process. 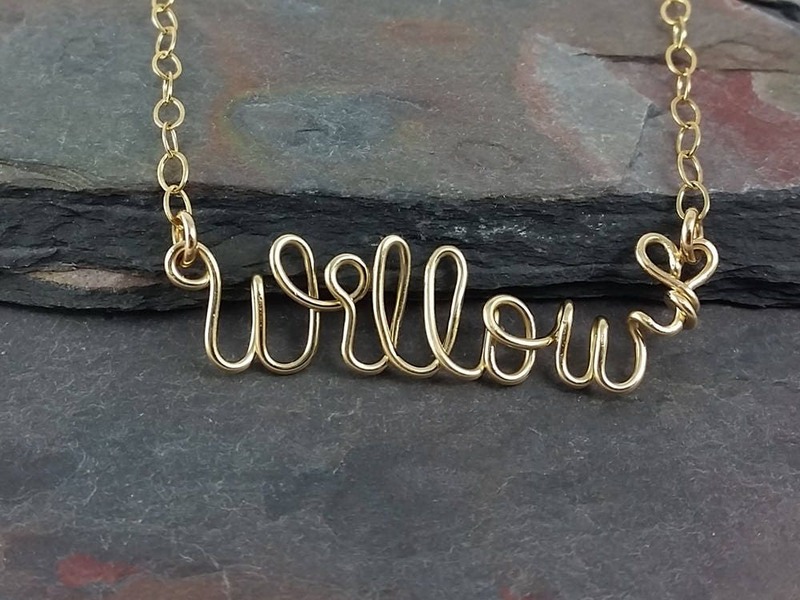 This listing is for the REGULAR size name necklace only. The regular size comes with a thicker link chain than the tiny size necklace. If you want a TINY size name necklace (shown for size reference) please look in my shop under Wire Name/Word Jewelry and select a TINY size necklace. for a delicate chain, or if you ask for tiny from this listing, the price will be the same and you will get the chain included with the regular size.